Most homeowners don’t think about their roofs, as shown in Figure 1, until some damage is evident. Yet the roof and its roofing material are one of the most important structural parts of the home. The roof and its associated roofing material keep the homeowner and their families warm, dry and protected from the varying weather conditions. While we don’t think about our roofs, most homeowners will have to replace their roofing material every ten to 15 years. There are numerous alternatives in the type of roofing materials now available and homeowners should make themselves aware of the advantages and disadvantages of each. Many of the new roofing materials now available have been designed with a much longer life. Longer life means less waste being dumped in landfill sites, but it also means that your roof will not have to be repaired or replaced as often making your home more secure from weather for decades. If you require a new roof, you should consider your alternatives and be aware that even the color you choose can make a difference to your longer term energy costs. Lighter colored roofing material will keep your attic cooler as light colors do not absorb the heat from the sun as dark colors do. A cooler attic means that you will expend less energy to keep your home cool. The following are the most common of alternatives that can be used for roofing materials. It is by no means a complete list. In North America composition asphalt shingles are by far the most common roofing material used, primarily because of cost. Asphalt shingles are made by saturating layers of paper with tar and then applying a coating of tar to hold a final layer of ceramic and/or mineral granules which protects the asphalt shingle from wear and the sun's ultraviolet rays. The asphalt shingle is completely waterproof. Fiberglass asphalt shingles are similar to composition asphalt shingles with the exception that the layers of paper are replaced by layers of fiberglass matting. Fiberglass asphalt shingles provide better fire resistant properties than the composition asphalt shingles. Because the asphalt shingle is made in pieces that are three feet long, the primary problems associated with asphalt shingles are with their installation. High winds can rip asphalt shingles off the roof and allow rain to penetrate into the roof sheathing and into the house. Asphalt shingles also have a limited life, usually 10 to 15 years, although some manufactures make thicker, more layers of paper and tar, asphalt shingles which will last up to 25 years. 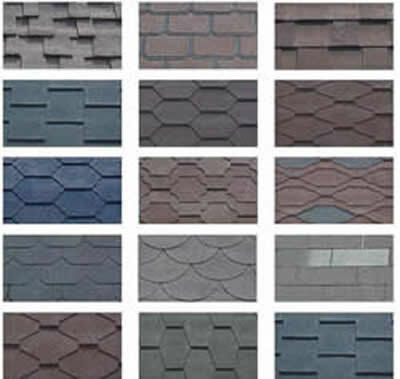 Some manufacturers are designing their asphalt shingles to provide some different visual appearances, as shown in Figure 2, in order to make the asphalt shingle roof more aesthetically pleasing. Most home handymen can install a shingle roof as it is not a complex process. Additional information on asphalt shingle roofs.